PROJECT: A wax jacket for the ever changing Irish climate. I also wanted to ‘buy local’, purchasing things from retailers on this little island rather than sourcing from abroad. 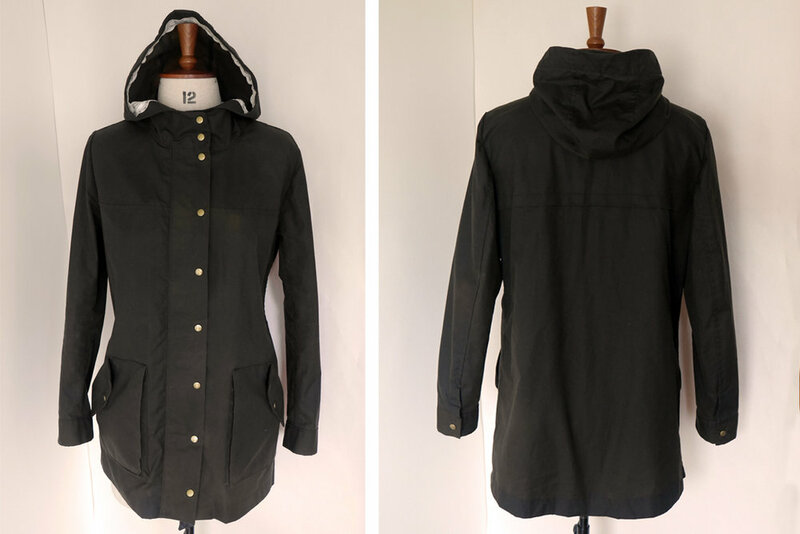 REASONS FOR MAKING: I wanted a jacket for the wind and rain which is on the way and let’s face it, Barbour Jackets are slightly outside my budget! FABRICS: Waxed cotton from Templemoyle Mills, Northern Ireland. Style: Templemoyle 6. Col: OL01. TRIMS: A pretty lace from my stash to use instead of binding. Brass 12mm anorak snaps x 13 from www.dressfabrics.ie. Open ended metal zip (26”) from Hickeys. HOW TO: I knew this would be a slower make so I nerded it up and read all the instructions carefully before getting stuck in and making a toile, which I would definitely recommend. Yes it’s a pain, but really worth it since for me, the shoulders needed taking in a little and the popper placket made a little wider. I’d have been raging had I gone to the bother of making the whole thing and it not be as right as it could be. It also allowed me to adjust the hood size. I often find that hoods are too shallow if my hair is tied back and I guess that’s one of the bonuses of making your own because I could change the hood depth. So now, no more hood slippage. Bonus! I searched #kellyanorak A LOT before I’d even bought the fabric and continued to do so throughout the process. It was flagged by a few people that one of the facings had been illustrated back to front in the instruction diagrams, but the pattern pieces themselves are correct so I was at least aware of this before questioning my sanity! Other than that, the instructions are clear and nicely laid out. Everything else was straightforward, notches matched and nothing went terribly wrong. 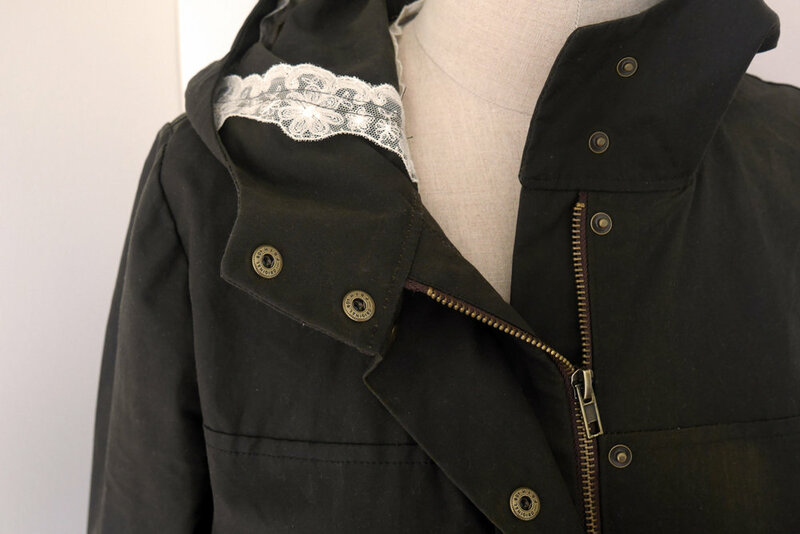 I used felled seams throughout and covered the hood seam and hem edge with a cream lace which I think makes a nice contrast with the waxed cotton. I was pure lazy and didn't change my thread when sewing the lace. Now I'm thinking should have. WHAT WENT WRONG: LITERALLY my first line of stitching. I got about half way across the back yoke before realising I hadn’t folded it out of the way as per the instructions. Not the best move with wax fabric since I then had to unpick and go exactly back into the holes I’d already made. Somehow, I managed it! Something that I was very lucky with, was reading the blog post by Karu of http://www.studiocostura.com before I started constructing my jacket. She had also extended the placket and mentioned she forgot to extend the hood to match. Eh…yup…me too! While I had already cut the fabric, being aware of this allowed me to simply reduce my seam allowances so it would fit. Phew! Thanks again Karu for the heads up! The only major thing however, was this : 1 + 1 = 2, the earth moves around the sun and hot irons melt wax. Did this cross my mind once? Nope! So there I was, fusing my plackets, pressing my seams (with calico above and below to protect the ironing board and iron…you’d think that would have turned on the aul lightbulb eh?!) delighted at how crisp they would look only to see when I’d finished, that there were patches of…let’s just say ‘less waxed areas’ all over the front. Not wonderful but I’m going to tell myself it just looks aged! Next time I’ll just stick to finger pressing. LESSONS LEARNED: TOILE & RESEARCH! Without all those wonderful makers out there who have also written up their experience while making this jacket, I would have made a few annoying errors that were easily avoided and doing a toile really helped to make the little adjustments that make it fit just that bit better for me. VERDICT: This was my first attempt at using waxed cotton and I was surprised how well it went. My years in college of being told not to pin my fabric together while sewing (not sure why!) definitely paid off here since pinning would have left lots of little holes in the fabric. I got to wear my Kelly anorak for the first time while up in the wilds of Donegal, an area famous for weaving tweed fabrics. Since I have almost enough wax fabric left over from Kelly 1, I bought some tweed to use in Kelly 2 so that probably tells you I liked this project enough to do another version. Hopefully I’ll have it done before the winter really kicks in.